Click go the shears : for SSA or TTB unaccompanied [in F major] / Australian folk song arranged by Colin Brumby. Score: Botany Bay : SATB unaccompanied / Australian folk-song arranged by Colin Brumby. Score: Click go the shears : SATB unaccompanied / Australian folk-song arranged by Colin Brumby. Score: Click go the shears : for SSA or TTB unaccompanied [in E flat] / Australian folk song arranged by Colin Brumby. Score: The springtime it brings on the shearing : traditional Australian folksong arranged for mixed voices SATB / by Colin Brumby. 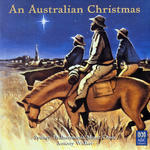 CD: An Australian Christmas / Sydney Philharmonia Motet Choir ; Anthony Walker, conductor.